Background image of A man's hand holds a shell from several pots of clams in the background. 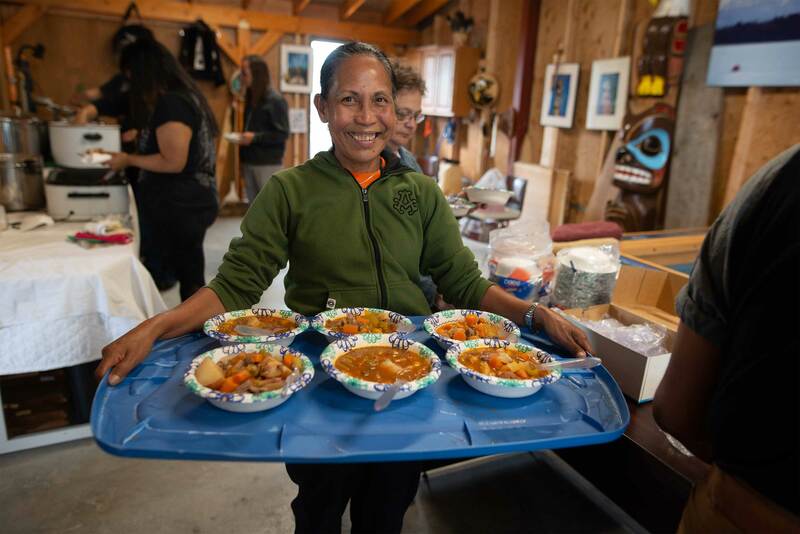 On September 8, 2018, more than 75 Hoonah locals headed for the Yaakw Kahidi (Canoe Shed) for the Huna Traditional Food Fair. 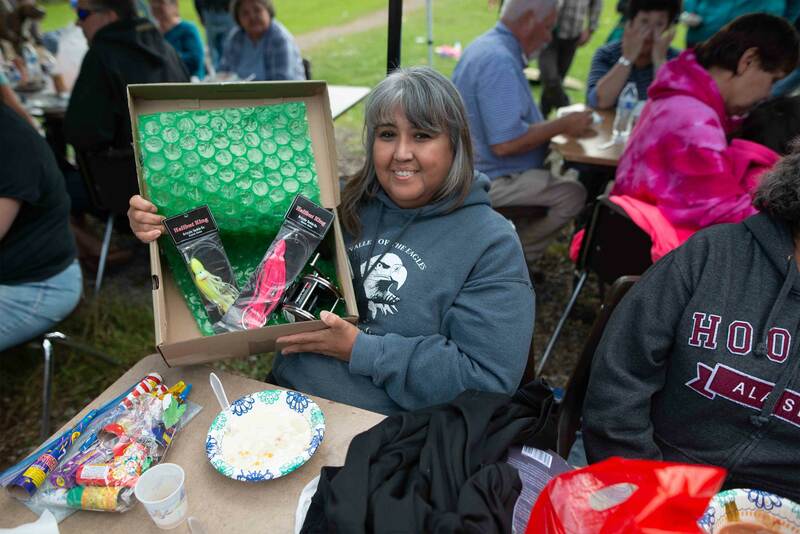 Together, while gathering over our favorite foods and with community members of all ages, we celebrated the Xunaa Tlingit Way of Life. Photos by Ian Johnson. 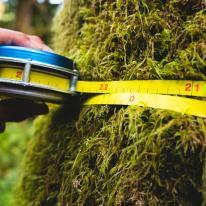 At the beginning of the summer, I set out for Hoonah, Alaska, as an Ecotrust Indigenous Fellow. During my time here, I have connected with family, made new friends, and jumped in to fishing, foraging, and hunting traditional foods that I enjoyed with my family growing up, and now have the opportunity to provide. 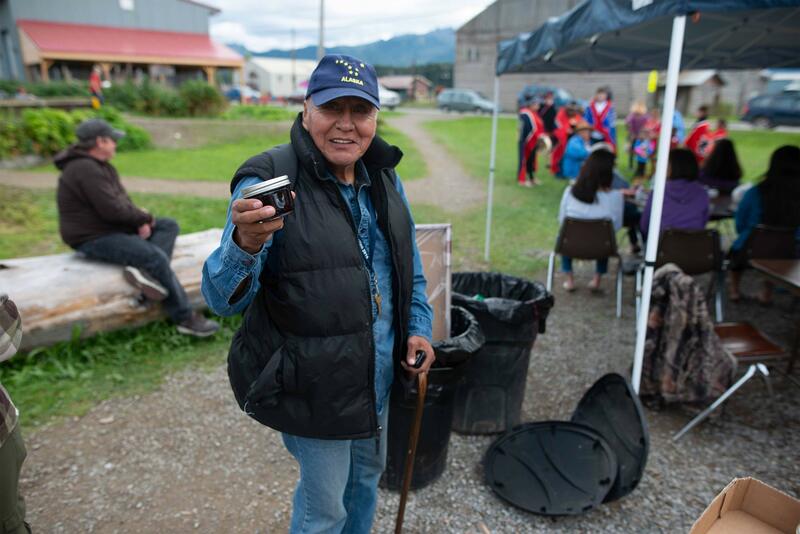 I also had a chance to be a part of the partnerships and programs that have formed in Southeast Alaska to keep the culture alive. As a capstone to my Fellowship, I had the good fortune to help coordinate the Huna Traditional Food Fair. 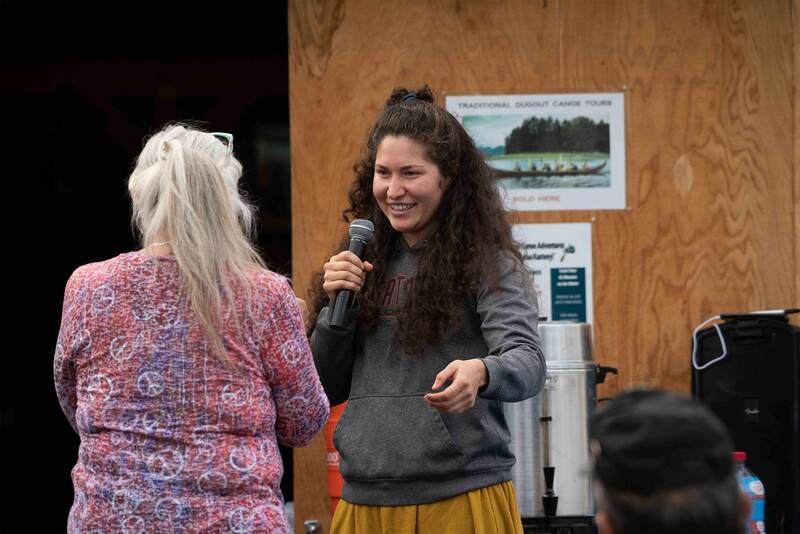 At the Fair, community members competed for “favorite” seal grease, baked halibut, deer ribs, and berry dessert in the cooking competition, local groups entertained with traditional songs and dances in beautiful regalia, and, of course, we shared a (really big) meal together. Among the friendly competition, games, and entertainment, however, was an important centerpiece: the re-distribution of pounds and pounds of traditional canned foods. Beyond being delicious, sharing these foods back to our community and elders is symbolic of our wealth — an abundance that is intricately linked to our relationship with the land, and an important indicator of our well-being. Darlene See, Food Fair Committee member andCultural Specialist for the Hoonah Indian Association, plates seal grease for the cooking competition. A traditional way to enjoy seal grease is to use it as a dip with dried halibut, which is also how our judges tested the various entries. Darlene also volunteered her time to sew our “Best in Show” prize for the competition, a sea otter pillow! Karen Hinchman ponders a seal grease entry during the cooking competition. 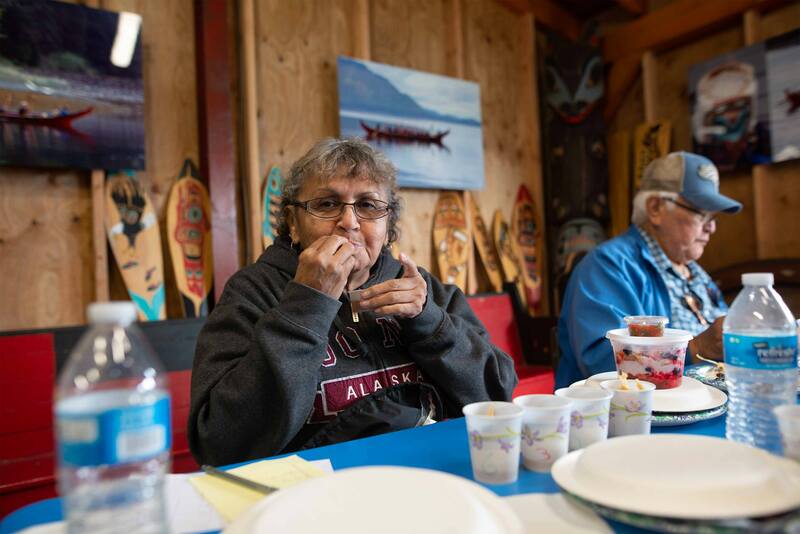 Huna Elders were invited to be our judges because who has better knowledge of our traditional foods than our elders? It was our intention to include community members of all ages, and we felt that this was a great way to put Huna Elders on the platform they deserve; as experts and authorities of the foods we take care of, and the Xunaa Way of Life. One thing that everyone agreed on is how nice it was to gather over our favorite foods for happy reasons. Amelia Wilson, Director of Huna Heritage Foundation, dances with Gawt’akan, one of Huna’s three traditional Tlingit dance groups. Wilma jumping right into her civic duty, serving deer stew. 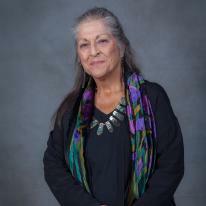 She never hesitates to help serve the elders and family members in attendance. 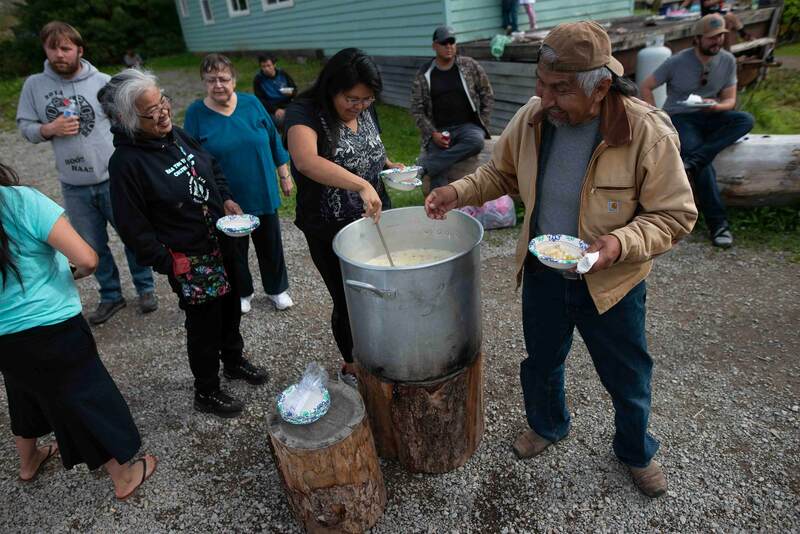 Community members gather around a giant pot of halibut chowder. We were amazed to see how many people had room for the chowder, after the first course of gallons of deer stew. Everything was prepared by our cherished cooks Mildred Wright and George Westman. The cakewalk gets a thumbs up! 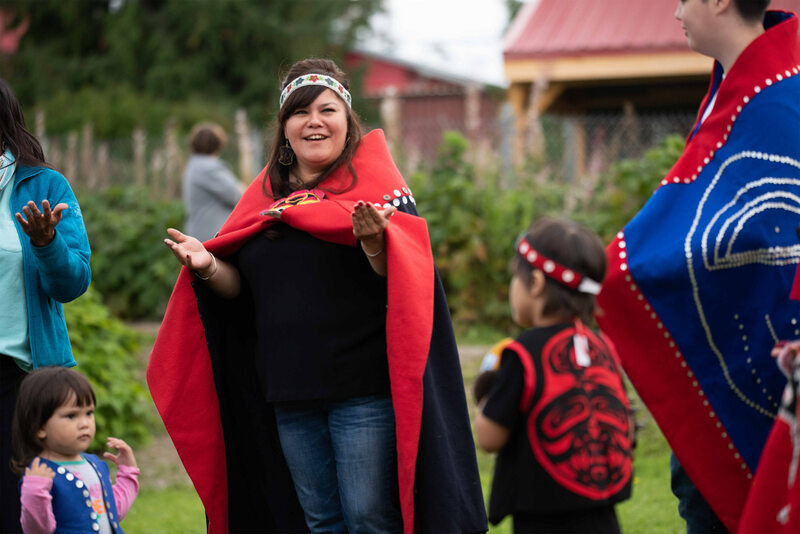 Ian Johnson of Sustainable Southeast Partnership designed an educational cakewalk which incorporated a Tlingit language lesson with berry identification. Our partners carry cases of food to guests waiting patiently for the jarred food distribution portion of the event. 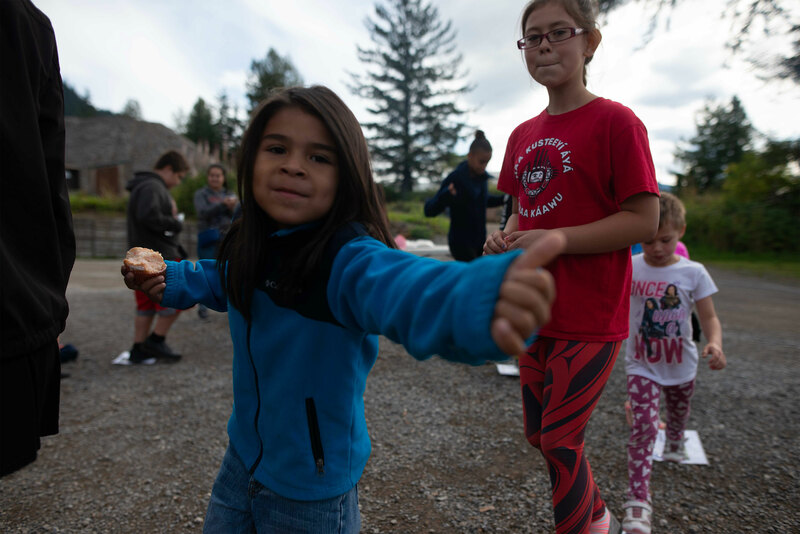 Together, over the summer, the HNFP Crew and TRAYLS youth gathered, preserved, and shared more than 336 jars of traditional foods including blueberry jam, beach asparagus, fireweed jelly, pink and Coho salmon. All of our partners agreed that the most impressive part of the event was how happy people were during the distribution, especially the elders. It took many partners and contributors to make the Food Fair possible. 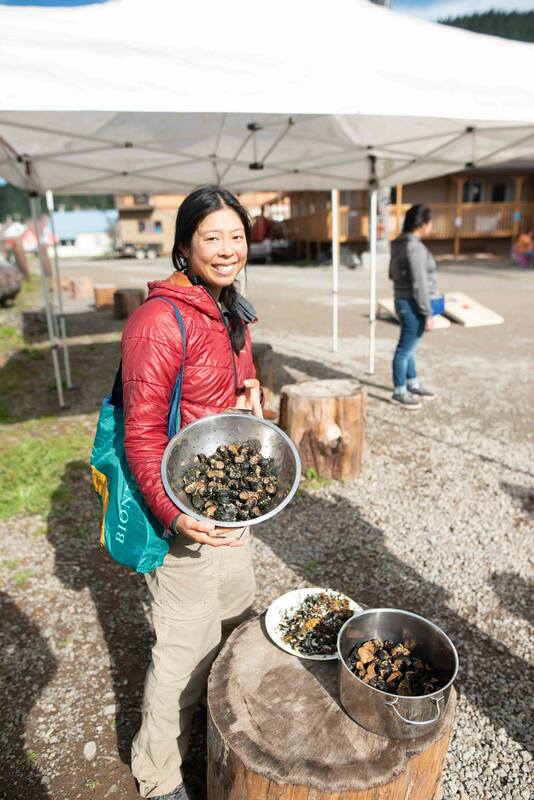 “Haa atxaayí haa kusteeyíx sitee, our food is our Tlingit way of life.” A bountiful past, present, and future that the Hoonah Native Forest Partnership intends to help foster, maintain, and uphold with the help of the community. 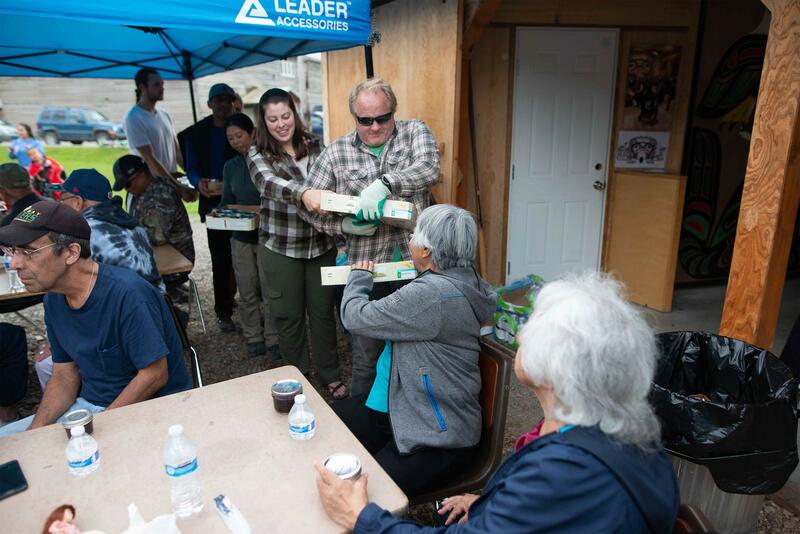 Pictured here, I am gifting one partner, Mary Peterson, earrings made of bear grass and cedar, a traditional style of jewelry from Southern Oregon coast tribes. Thank you to our partners and sponsors whose support made this event possible: Sustainable Southeast Partnership, Hoonah Native Forest Partnership, Huna Heritage Foundation, Hoonah Indian Association, SEARHC, Alaska Native Sisterhood, SEAWEED, Sealaska Corporation, Hoonah Trading Company, Alaska Seaplanes, Alaska Nugget Outfitters, Tideland Tackle & Marine, Icy Strait Lodge, The Office Bar, Icy Strait Point, and Huna Totem Corporation. Thanks also to the community who came out to support us. We were so happy with the turn out of cooks who participated in the cooking competition; you made our day, and stuffed our elders to the brim! And thank you again to those who donated to the public meal. Food donors include: Raino and Collette Hill, Adrien Lee, Josh Dybdahl, Ian and Kassie Johnson, Wilbur Skeek, Allen Fisher, the Contreras family, Cheyenne Hill, Darlene See, Rebekah Sawers, Don and Bob Starbard, Jolene King, Johan Hinchman, and Dave Marvin. And a special thanks to Mildred Wright and George Westman for putting together such an amazing meal. Gunalcheesh, Haw’aa! To the many people who take care of Our Foods, and keep Our Way of Life alive. Our hearts are smiling to celebrate you and all that you carry for our future.